Team DLS have just returned from their first European International show at Bonheiden in Belgium. Louise had Louise Anderson’s Felix and DLS’ own Fiona van het Lemmenshof for the CSI2* and David had his own and Charlotte Platt’s Jenson 55, Colm O’Donnel’s The Jeweller and new ride Gutera Cara Dubh for the CSI2*, as well as homebred Balloon Cruise and Cbs Chino Noir, recently sourced from Cheryl Broderick for the Six Year Old CSIYH1*. First to jump were the six year olds on Thursday. The arena at Bonheiden is totally different to anything they would have seen in England, with huge advertising hoardings round three sides and a big catering marquee, bar and seating on the fourth side. Balloon Cruise was only at her seventh show and her first international but was totally un-phased jumping a lovely clear round, whle Cbs Chino Noir also jumped very well. Next class was the CSI2* 1.30. With 126 starters this class was split into two sections. Louise won section A on Fiona, a really thrilling round for this lovely mare in her first show for over a year. Jenson jumped a steady clear and David was 4th in section B on Gutera. On Friday the young horses jumped again. Chino Noir jumped a lovely double clear and Balloon Cruise jumped very well, just having a pole in the jump-off section. The next class was the CSI1* 1.40 Grand Prix Qualifier. Felix, Gutera and The Jeweller all jumped good rounds. But it was Louise and Fiona in the 1.30 who jumped a fiercely competitive round in the 1.30 to come second. On Saturday the Six Year Olds had their final. Both Balloon Cruise and Chino Noir jumped clear in the first round. With sixteen horses through to the jump-off it was competitive from the start and both horses jumped stepped up to the plate, with Balloon Cruise finishing second. 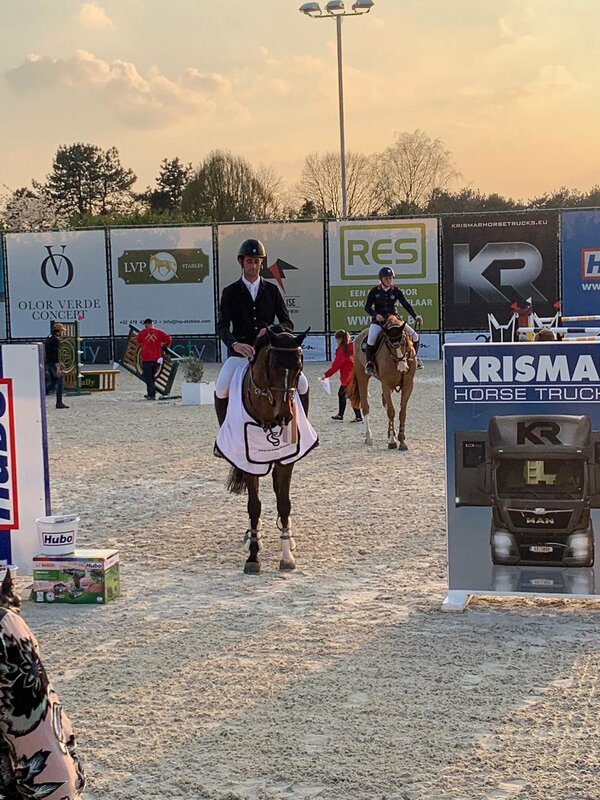 A fantastic result for her first international show, and how exciting for the team to have bred such an promising youngster from David’s former team ride Cruise With Me. The only other class of the day was the 1.45 Longines Ranking Class. Jenson flew round to jump a clear in the first round and an extremely fast clear in the jump-off to win the class, also finishing in the monet. It was also lovely to see Grupello Z, who DLS sourced and produced, going so well and finishing 6th in the Ranking Class with Kellie Taylor. On Sunday Fiona and the Jeweller jumped the 1.30 in the morning before Felix and Jenson jumped in the 2* Grand Prix. Both horses jumped clear in the first round, and with 15 through to the jump-off it was very competitive with only 1.5 seconds covering the first three horses. Jenson jumped absolutely brilliantly to finish 3rd and win his second very smart rug of the weekend.